Award Winning Organic Food & Top Growing Tips! 06 May Award Winning Organic Food & Top Growing Tips! The inspiration for this blog is another passion of mine, homegrown organic vegetables, salads, fruit and herbs. I really enjoy this time of the year in the garden as you can see the fruits of your labour starting to develop. Since I was a young boy I have been growing my own vegetables. Seeing your crops grow from seeds to full maturity gives an amazing sense of satisfaction and achievement and I’m lucky that I have our Toscana Italian Restaurant to showcase mine. During the summer months I grow 70% of produce in my garden that is used in Toscana. When March arrives (and hopefully the frost is fully gone) I start preparing the soil and planting out my seeds. Now, in early May, all the seeds have sprouted and are all growing beautifully. It’s very rewarding watching your harvest grow, if you have some green fingers you’ll know what I mean here but it is hard to quantify the enjoyment derived from growing your own. From a nutritional point of view it’s also great to know that our Toscana dishes are packed with wonderful homegrown fresh organic ingredients for our customers to eat. Creating menus around locally sourced produce in harmony with our homegrown produce is a very exciting part of the day in my restaurant kitchen. 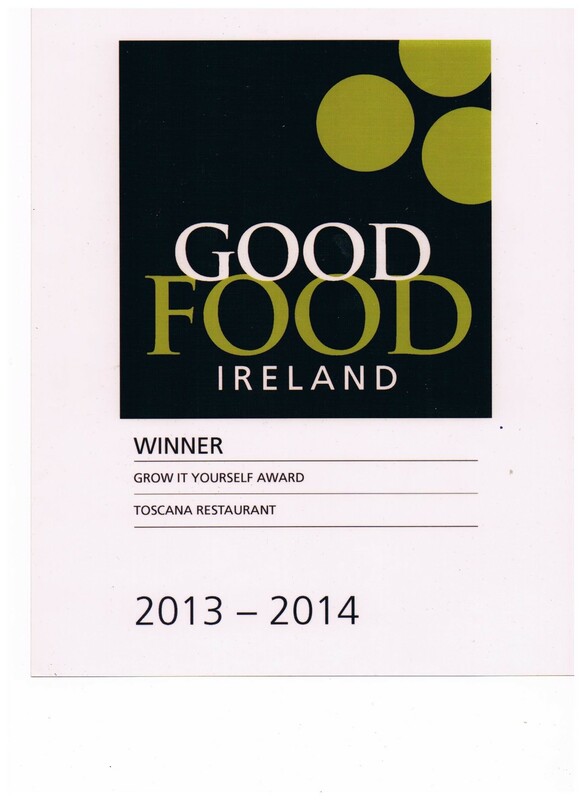 In 2014 Toscana Restaurants received the Good food Ireland grow it yourself award for best grow it yourself restaurants in Ireland. It really was an honour and a joy to receive this prestigious award. Now, I know we don’t have the beautiful Italian weather here in Ireland but Irish climate is mild and moist which is very good for growing. It’s easy, fun and inexpensive not to mention rewarding to grow your own vegetables, and you don’t need a large garden. Most vegetables adapt well to growing in pots, eg :carrots, lettuce, potatoes, courgettes etc… Herbs are also a great asset as you can use them in cooking and fresh herbs give a much nicer flavour then dried herbs. It’s such a pleasure picking your own crop and then cooking with it in your kitchen minutes later. Make sure you are using good soil.This will make a huge difference to your crop. Plant in a sunny spot in the garden or patio. If the weather turns cold or frosty protect your crop by lightly covering them, but remember to uncover them the following morning. The best time for harvesting crops is in the morning or evening time when it is cool. If you are a first timer carrots and salads are easy to start with. For the best flavour eat your crop as they harvest. Crucially don’t get disheartened if your vegetables don’t grow as well as expected. Many gardeners have a few failures each year – myself included and that’s part of the process. As the season progress I’ll keep you posted on how my crops are doing and if you’d like to taste some of the freshest Italian food in Dublin, then book your table here. Ciao!